DEKALB, Ill. – The MAC issued a statement Wednesday that clarified why a technical foul wasn’t called against Northern Illinois in the final seconds of the Huskies’ 77-75 upset of No. 14 Buffalo in a men's basketball game Tuesday night at the Convocation Center. Nate McCarty hit the go-ahead layup for Northern Illinois with 0.6 seconds left in regulation. UB’s Nick Perkins threw the ensuing inbounds pass to Jayvon Graves, who attempted a 3-point heave from just outside the perimeter in UB’s defensive end of the court. Graves’ toss caromed off the backboard then rolled back onto the court as fans began to swarm the floor. However, UB had called timeout before Perkins had inbounded the ball. Fans were ushered off the court and officials reset the clock. UB turned the ball over and the clock expired. Fans then stormed the court again. 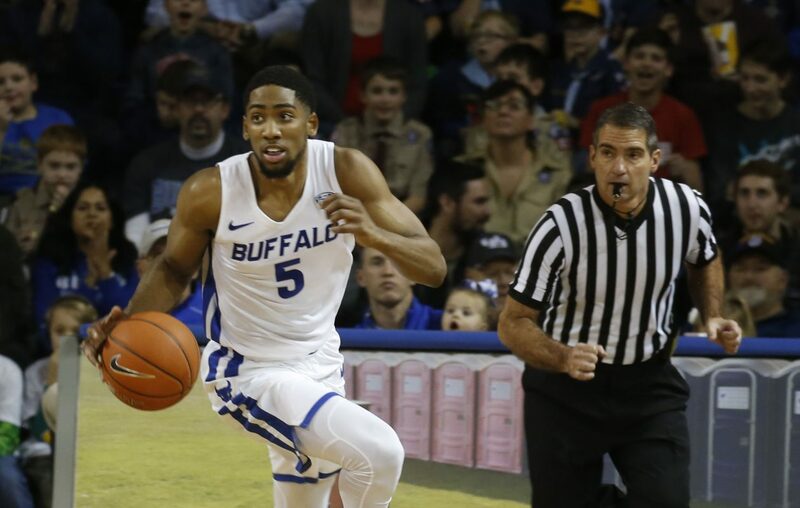 A UB athletic spokesperson said that game officials clarified to Oats on the court that a technical foul was not issued because UB had called a timeout. Asked if a technical foul would have been called had UB not called timeout, the spokesman said, "No, because it would have not affected the inbounds play." UB has not contacted the MAC about the end of the game Tuesday, the spokesman said. The final seconds of the game were reminiscent of an Atlantic 10 Conference game between St. Bonaventure and VCU on Feb. 4, 2017, at the Reilly Center in Allegany. St. Bonaventure’s Matt Mobley hit the game-winning 3-point shot with 0.5 seconds left in regulation, which gave the Bonnies a 66-65 lead, and Bona’s students started to storm the court. Referees called a technical foul against the Bonnies, which awarded one free throw to VCU. JeQuan Lewis hit the to send the game into overtime, 66-66, and the Rams won 83-77. The Atlantic 10 said in a statement a day after Bona’s loss that the technical wasn’t assessed solely because of the court-storming. "The administrative technical foul was assessed for multiple reasons," the conference said. "The most significant was an individual taking the game ball from the inbounding baseline [assuming time had expired] and walking down the sideline, causing the VCU player to look for the ball, and chase the individual to secure the ball for inbound. Simultaneously, one of the game officials collided with a fan on the court, prior to the inbound toss. It was after these violations that the clock expired, and the students and fans stormed the court with :00 on the clock." In December 2016, Dillon Brooks hit a contested 3-point shot at the buzzer that lifted Oregon to an 89-87 win against UCLA in Eugene, Ore. Fans stormed the court at Matthew Knight Arena with 0.8 seconds left, but referees did not issue a technical foul against Oregon.